If you are using MSIE, here is something to check out : have a look at my Flickr Profile, and compare with another profile. If you are not using MSIE, here is what you are missing : Skinning Flickr with an XSS exploit. 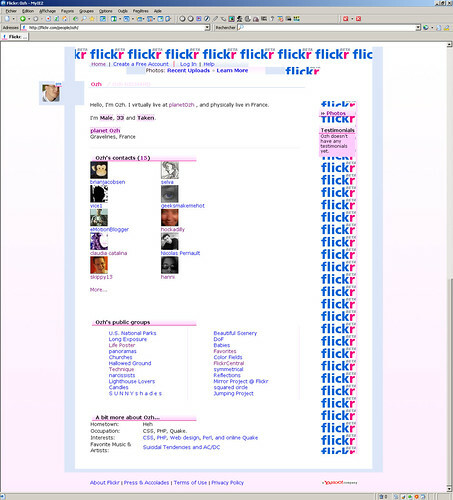 This would replace Flickr's CSS location with mine. Ok, I'm now warning Flickr's admins about this or they might just kill my account :-P Done, and they fixed it. si il n'y avait que celle la ! Frazer » Sorry, I'm not.